The idea that art and science are at opposite ends of a spectrum of human endeavor is a relatively recent one. Throughout most of human history, and still today in many cultures, art has been far more deeply embedded in day to day activity and world view. In recent centuries, and only in advanced industrial societies, has art come to be synonymous with the fine arts—a boundary which has become a wall. It may help us to see the large areas of commonality between art and science if we remind ourselves that what we now call art was techne—a term which distinguished the human-made from the naturally occurring— to the ancient Greeks, and that this sense of art lasted even into the twentieth century in the US in expressions such as useful arts, which referred to fields such as engineering. Art and science also have common roots developmentally. A child’s exploration of the world is sensory, experimental, concrete, and embodied. The first Kindergarten materials, created by German educator Friedrich Froebel, drew on his background as a scientist, and particularly on his study of crystal structures. That Froebel’s unit blocks, paper weaving, and “pea-and-toothpick” sets had a profound impact on artists and architects of the 20th century has been elegantly documented. Less well known is the impact on 20th century science, although a strong circumstantial case can be made. Richard Feynman’s mother was a trained Froebel Kindergarten teacher who surely used the materials at home with her first-born; Richard’s father declared his desire that his son be a scientist. Feynman’s famously visual approach to problem solving, his diagrams, and his declaration that “mathematics is pattern” make particular sense for a scholar whose early learning made use of the new, tactile, manipulative and geometric approach to children’s learning. Asking whether these early learning materials are art or science materials makes no sense—they are the wellspring of both. In our endeavor to bring art and science back into close connection, the work of educator and philosopher John Dewey helps to point the way. Dewey famously stressed the centrality of experience in learning, and the activity of inquiry as the driver of learning. Dewey also rejected many commonly held dualisms, such as the Cartesian mind/body dualism, preferring instead to speak about the body-mind; this term was his way of uniting two things that, like art and science, had become separated. Recent research in neuroscience confirms Dewey’s conviction that learning and cognition are embodied—that is, that the body and the brain are an inseparable system, a body-mind, that learns and acts in and with its environment. Inquiry is an activity that both art and science have in common. Scientists and artists may explore the properties of materials; may interrogate and critique concepts; may ask how past accomplishments affect their future work. Dewey’s inquiry is active, embodied, rational, aesthetic. It is also interactive. Inquiry requires that we have things to inquire about. It is to this subject that I want to turn, using the odd but instructive example of crocheted hyperbolic planes. A hyperbolic plane is a mathematical object, and a crocheted hyperbolic plane is a yarn model of that object, made with some simple crocheting. In formal terms, a hyperbolic plane is a surface of constant negative curvature—sort of the opposite of a sphere, which is a surface of constant positive curvature. If you find it hard to imagine, so did many mathematicians; until the 19th century, a hyperbolic plane was thought to be an impossible object. The first crocheted hyperbolic plane was made by computer scientist and mathematician Daina Taimiņa, using the skills she had been taught as a girl growing up in Latvia. My own relationship to math was one of misery and torment, from grade school all the way through graduate school. When I first heard the phrase “crocheted hyperbolic plane” and realized that there were people who were making mathematical models with yarn I was shocked and intrigued. In my own mathematics education there had been no hint that such a conjunction would be conceivable. 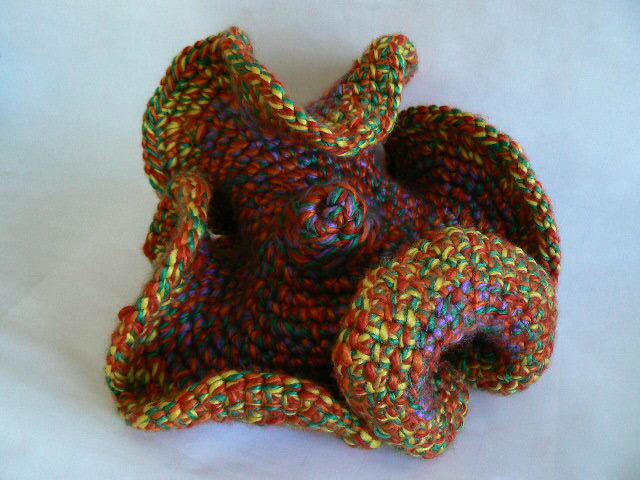 Thus began my own inquiry into math and other topics, launched by the crocheted hyperbolic plane. A crocheted hyperbolic plane is made by starting in the center and working outward in a spiral path, repeating the same crochet stitch hundreds of times. The instructions are an algorithm, not a formula; they are of the form “make X stitches, then make two stitches in the same location.” The maker can decide what X is and then follow the procedure, receiving in the process a simple introduction to algorithms and variables. A crochet pattern and a Java program would represent these same instructions in very different ways. What is the clearest way of representing this algorithm, and for what audience? As you make a hyperbolic plane, its shape changes in unexpected ways. It may start as a bump or a flat disc, depending on the rate of increase and the bulkiness of the yarn. As you continue, the edges of the disc begin to buckle, then form the ruffled pattern of the finished product. Making a crocheted hyperbolic plane is a simple, tangible illustration of the systems principle of emergence, in which simple elements repeated form a whole that is quite unlike the individual elements. Repetition in the making of a crocheted plane has pattern and a rhythm. Visually, the finished plane also has these properties. What did Feynman mean when he said “mathematics is pattern?” Does the crocheted plane shed any light on this? When making a hyperbolic plane, if you continue past the point where the ruffles are gentle curves, they become more acute and more tightly packed, and ultimately the crocheted hyperbolic plane approaches a sphere as its limit. The ideal, mathematical plane hyperbolic plane has no limit. Nor does it have thickness, or a spiral pattern. In what ways can a model both be, and not be, the thing it models? How might we be informed, or led astray, by using a model? How do the materials we choose (bulky vs. thin yarn, for example) affect how the model performs? Crocheted hyperbolic planes are engaging, even for those who say they “hate math.” I have spent hours discussing math and math education with everyone from mathematicians to math phobics since I began making and handing around these models. They draw people in and spark inquiry; they can also help people to “get a grip” on math concepts. Crocheted hyperbolic planes are beautiful. For people like me who never understood what “the beauty of mathematics” could possibly refer to, it’s a revelation. Yes, the beauty comes from the color, the sheen of the yarn, and other qualities, but it also comes from the elegant mathematical characteristics of which it is a model. In American culture, math is associated with males, and crochet with females. Even though women and girls have made great strides in math performance in school, there is still a stereotype about girls and math that suggests that girls are less capable. Crocheted hyperbolic planes are provocative because they unite advanced mathematics with something associated with the feminine. In pilot research at the University of Massachusetts Lowell, we have found that women who hold a crocheted hyperbolic plane while listening to a math lecture and taking a test are more likely to report that they like math and would take more math courses, and are less likely to report math anxiety. As Sherry Turkle rightly observes, objects can be evocative. We have all had the experience of emotional responses to objects, and research shows us that emotion and learning are closely linked. Indeed, one of the implications of the recognition that cognition is embodied is that thinking and learning also have an emotional component. Evocative objects elicit emotion and provoke more sustained inquiry. Are crocheted hyperbolic planes art, or are they STEM? The answer is yes. Of course many objects can provoke inquiry. Examples from other SEAD White Papers include the Siler and Ozin Periodic Table of Nanomaterials and Tatar’s discussion of sewed circuits. The list of possibilities is endless, although some objects and materials are more conducive than others to productive and sustained inquiry. There is a stumbling block for those of us who believe in embodied cognition and that the body-mind should have evocative objects and environments with which to inquire. It is the prevailing belief, inherited from many sources including the Enlightenment and psychologist Jean Piaget, that adult learners are abstract thinkers and therefore do not need or benefit from “the concrete.” In fact, as Piaget himself acknowledged, novice learners of any age can benefit from starting with physical materials and representations, interaction with which can scaffold more abstract thinking. The history of the STEM fields is full of examples where discoveries were sparked by objects and images, not just “abstract reasoning.” STEM learners, like learners in the arts, benefit from interaction with materials. Action: Create great, field-specific examples of object-based inquiry in the classroom. Through research and practice, develop a counter-narrative that demonstrates the benefits to students. Barrier: Most college classrooms are barren spaces, often with only whiteboards, chairs, and computer technology. Faculty move from classroom to classroom and may therefore have a hard time customizing a room. Action: Create resource-rich lab/studios for learning, perhaps tailored to the needs of a particular discipline or disciplines. At a minimum, equip each classroom with a cabinet so that physical materials can be stored and easily retrieved by faculty. Barrier: Faculty generally teach as they were taught. Action: Create PD experiences that are offer new and revelatory learning experiences organized around engaged and inquiry-driven interaction with objects. Support the development of new curriculum. Barrier: We infrequently evaluate teaching methods and effectiveness, or do research on what works in college. Action: Create a culture of research and evaluation, of metacognitive discussion of teaching and learning, through on campus teaching centers, classroom assessment, and funding paired with technical support that allows more research and evaluation to take place. Barrier: The arts are being driven out of K-12 by the stress on academic subjects. Students who do not respond well to current teaching methods are discouraged from pursuing STEM. Action: Leveraging embodied knowing by using aesthetically informed pedagogy can improve learning of STEM subject matter and include more underrepresented students in STEM engagement. Barrier: Teachers do not have the time to develop whole new curricula and approaches. Action: Develop curricula and exemplars of inquiry with objects to guide and inspire teachers. Barrier: Teachers do not know how to integrate the arts with STEM and other subjects. Barrier: Narrow view of the institution’s mission; lack of financial resources for space creation and staffing. Action: Develop a list of precedents and create a community of practice for informal ArtScience learning. Barrier: Informal STEM education is sometimes quite structured and “hands off.” Makers lack resources to create their own spaces. Action: Maker spaces support self-directed and synthetic interaction with materials, STEM content, and the arts. Promote the creation of maker spaces, a culture of tinkering and STEM inquiry, and validation of the sorts of learning that takes place in such spaces. Barrier: Math anxiety is pervasive in the US. Teachers with math anxiety may create anxiety in their students. Action: Workshops that use hyperbolic crochet, fiber arts, creative craft, and other engaging and non-threatening activities can open an effective and supportive pathway into math learning. Barrier: In many fields, a Thinking With Things approach to learning is unusual and therefore hard to find funding for. Action: Create solicitations that explicitly validate and offer to fund concrete, object-based approaches. Barrier: Many experiments in new learning approaches are not well studied, which makes dissemination and improvement difficult. Action: Fund and require excellent education research and assessment. Provide technical assistance so that investigators inexperienced in education research can be successful, or develop a funder-specific evaluation team to conduct the research. Brosterman, N. (1997) Inventing Kindergarten. New York: Harry N. Abrams, Inc.
Cheit, E. (1975) The Useful Arts and the Liberal Tradition. The Carnegie Commission on Higher Education. McGraw-Hill. Damasio, A. (1999) The Feeling of What Happens. Harcourt, Inc.
Johnson, M. (2007) The Meaning of the Body. University of Chicago Press. Pasztory, E. (2005) Thinking With Things: Toward a New Vision of Art. University of Texas Press. Piaget, J. (1972) “Intellectual Evolution from Adolescence to Adulthood.” Human Develop. 15: 1-12. Taimina, D. (2009) Crocheting Adventures with Hyperbolic Planes. Natick, MA: A K Peters, Ltd.
Turkle, S. (Ed. ), (2011) Evocative Objects. MIT Press.